Atlus USA. 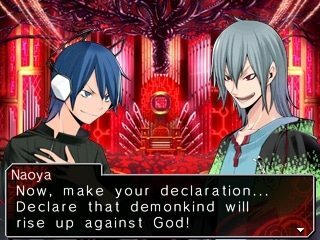 Inc. have announced that they are to release Shin Megami Tensei: Devil Survivor Overlocked for Nintendo 3DS during Summer 2011. Described as being an RPG/SRPG hybrid, the title is considered to be one of the best RPGs of 2009 and presented players with a novel premise: Tokyo is in full lockdown, the government’s swift, coldblooded response to a surprise demon invasion. While you and your friends must solve the nature of the interdimensional rift through which the horrific creatures are entering your world, saving the world is not your highest priority; staying alive, on the other hand, is. Having been expanded and enhanced for Nintendo’s latest handheld system, Devil Survivor Overclocked now features voice acting for the entirety of the game’s lengthy, unconventional narrative. Further to this, the story, which already encompasses multiple endings dependent on whichever critical choices the player makes, now concludes with an additional special eighth chapter which is a fittingly rousing epilogue for Shin Megami Tensei fans. The game’s beautifully remastered hand drawn artwork and character portraits benefit from the new system’s higher resolution screens, offering players a crisper, higher fidelity experience. SMT: Devil Survivor Overclocked is currently scheduled to release for Nintendo 3DS in Summer 2011 within North America, with no word on a European release.